ICEP’s exclusive online review program, Self-Study Online, is an extensive board review tool that helps you maximize your study time to review whenever you have free time, from anywhere with Internet access. Test your knowledge and exam preparedness with this detailed database of multiple-choice questions. The program features more than 650 visual-stimuli based questions, divided into short, 30- to 50-question Pre-Tests, Photo Quizzes, and Lab Tests – 26 different sections available! Most questions include images, and all questions are referenced to the 7th ed. Rosen and 6th ed. Tintanalli texts with explanations for the correct answers. At the conclusion of each section, print a full summary of the section, including the answers, references and explanations, for later review. All Self-Study Online users who successfully complete the program are eligible to claim a maximum of 27 AMA PRA Category 1 Credits™. 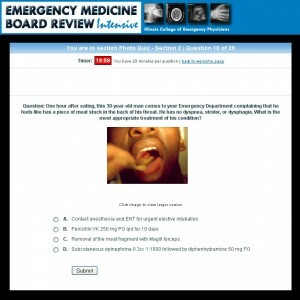 If you cannot attend the EM Board Review Intensive live course (which includes Self-Study Online access with the course registration fee), you can purchase Self-Study Online separately for $295. You will have access for 90 days to review at your own pace. This activity has been planned and implemented in accordance with the Essential Areas and Policies of the Accreditation Council for Continuing Medical Education through the joint providership of the American College of Emergency Physicians and Illinois College of Emergency Physicians. The American College of Emergency Physicians is accredited by the Accreditation Council for Continuing Medical Education to provide continuing medical education for physicians. 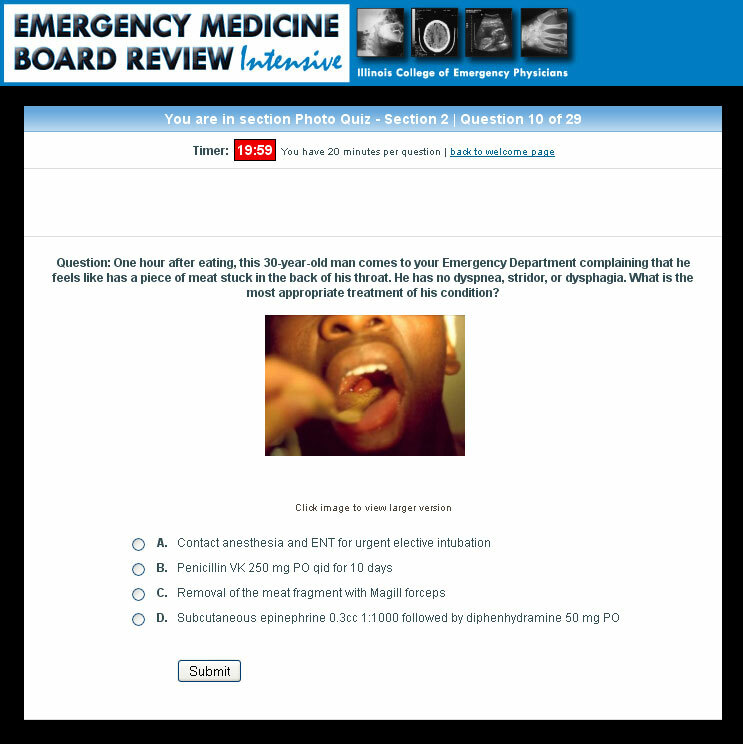 The American College of Emergency Physicians designates this enduring material for a maximum of 27.00 AMA PRA Category 1 Credits™. Physicians should claim only the credit commensurate with the extent of their participation in the activity. Approved by the American College of Emergency Physicians for a maximum of 27.00 hours of ACEP Category I credit. Provides 1.5 hours of pediatric topics that can be used in hospitals recognized in Illinois as EDAP, SEDP, or PCCC. Provides 1.25 hours of trauma topics that fulfill requirements set bt the Illinois Emergency Medical Services and Trauma Code.